This was not my A race - I have been focusing my training on longer races - but as my training and some recent short races have been good I felt I was in a position to get a PB. My marathon PB is 3.12.21, I was aiming for under 3.10 hopefully closer to 3.05 which I felt was realistic based on my training and races. I had a mini taper ( rest sat, only one run Friday, a few miles dropped on other runs, some gym sessions missed and no hard sessions during the week) and cut caffeine from Monday. 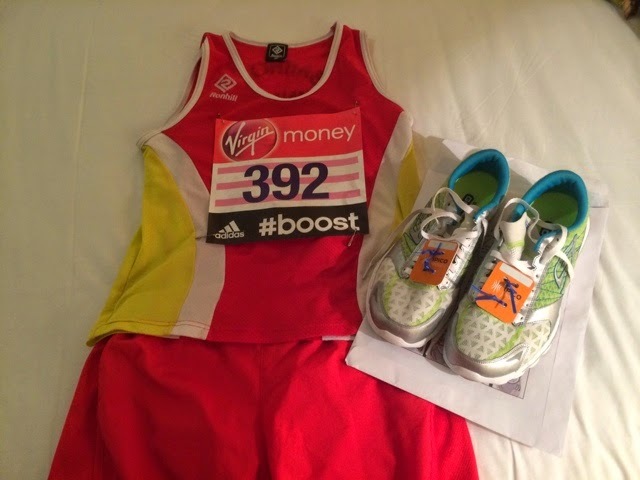 A week before I was confident but on race day I was not as I had picked up a cold/cough earlier in the week which had meant sleepless nights all week coughing; the hotel had a function until after midnight the night before which was far from ideal and I couldn't get the breakfast I wanted. I was at the championship start due to getting a sub 3.15 qualifying time. This meant short toilet queues as well as a marquee to change / wait in and generally a much calmer atmosphere. 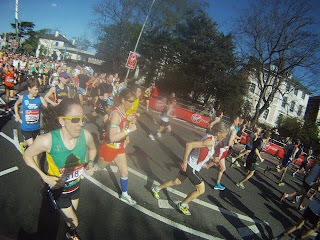 It also meant I got to start right at the front so would not have to fight past fancy dress costumes or slow celebrities who get to go from the front of one of the other starts or other slow people who had put the wrong time down deliberately to get in a faster pen. I was running for Macmillan http://www.justgiving.com/helen-james14 but had to wear my club vest from the champs start and no logos were allowed so I couldn't wear my usual 9bar calf guards! Got off to a good start, no hold ups like in previous years: I could more or less run at the pace I wanted. It was crowded but the traffic was flowing well and people were not running two and three abreast far too slow and getting in the way; there was no need to get my elbows out like in previous years! Thanks to Ian Berry who took this whilst running! I was feeling good for around the first 5 miles. Pace was marginally too fast but not by so much as to cause concern as the 1st and 3rd mile are downhill. It then all started to go a bit wrong, each mile got slower and slower. My legs felt fine but I had to slow the pace to keep my breathing under control. Although my cold had been a lot better by Friday my breathing was quite still laboured on my last run; I had hoped 48 hours later things would be much improved and whilst I was feeling fine pottering around London Saturday I was not over the cold enough to run well. Even today just sitting here my breathing is not quite right - it feels as if my airways are slightly blocked and I can't quite get enough oxygen in. The next 10 miles or so were not much fun - so many people were passing me which is really demoralising. It was frustrating that my legs were fine and wanted to go faster but my breathing wasn't having it. At around 17 miles the sub 3.15 pacer went past me which was probably the lowest moment as although I realised I wasn't going to get the time I wanted I had hoped I would still at least manage sub 3.15. It turns out the pacer was going too fast which was a relief. Felt better from about 18 miles as it was now not far to go and I wasn't being passed as much - lots of people were walking or slowing so I was passing people now. I knew for 3.10 I needed to be at 20 miles in 2.25, was surprised to get there only a minute too slow, maybe things were not quite as bad as I had imagined them to be in my head! I knew I couldn't catch up that minute; neither could I pick up the pace by enough prevent the deficit growing so a PB was off but hopefully sub 3.15 still on so I kept going at about the same effort which was one that was not taxing my breathing too much. It felt good to get to 23 miles as that was just over a park run, I had just under 25 minutes to get that done and get sub 3.15 which is what I did. I managed to do a bit of a sprint finish ( well in my head it was a sprint). 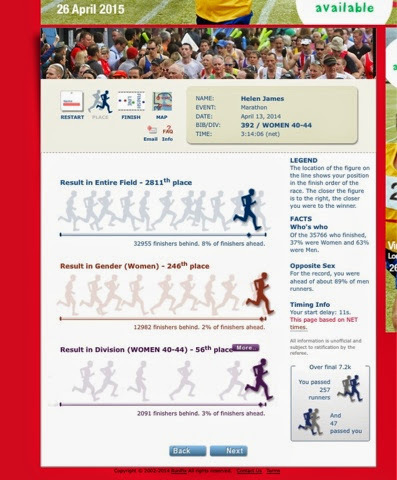 My time was 3.14.06 which gets me a championship start again but is not the time I was wanting or felt I was capable of. When I finished all I could think of was getting some water, I must have been very dehydrated as I am not usually that desperate. My splits tell the sorry story, I do like the bit bottom right which says that I passed loads more in the last 7.2km than passed me! Another positive is that I wore my new Gorun3 which had only done 11.5 miles, they were very comfortable, light but had sufficient cushioning for 26.2 miles of tarmac.